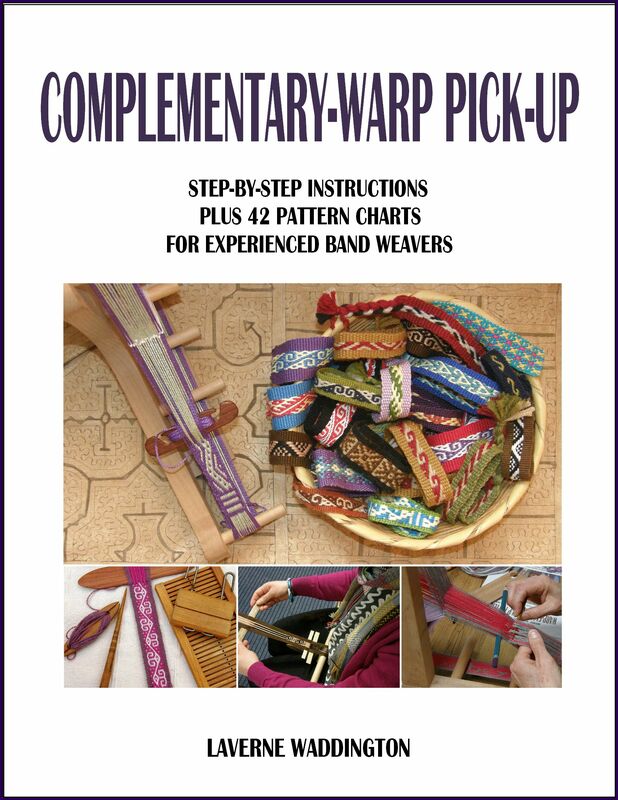 You may remember these designs from a previous post on supplementary weft patterning. 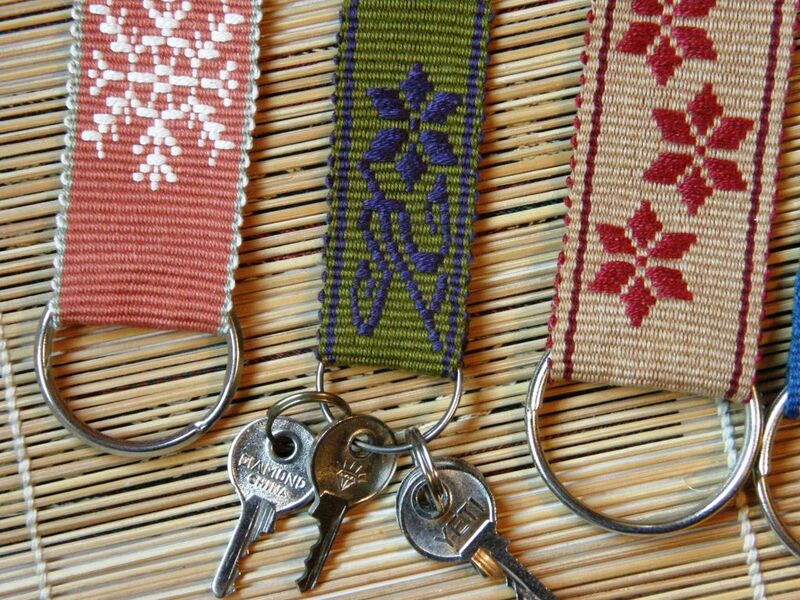 Now I am happy to present the promised tutorial on supplementary weft patterning together with a tiny project idea-key fobs. This technique definitely falls into the category of those which are within the reach of weavers who are already producing good warp-faced plain-weave bands with consistent beat and width. 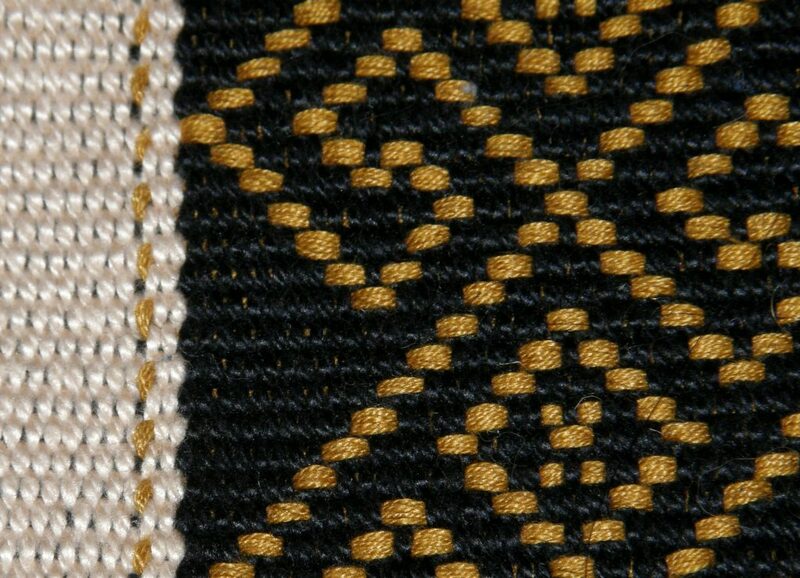 We weave a simple plain weave band and then ”paint” in some motifs with an additional weft. 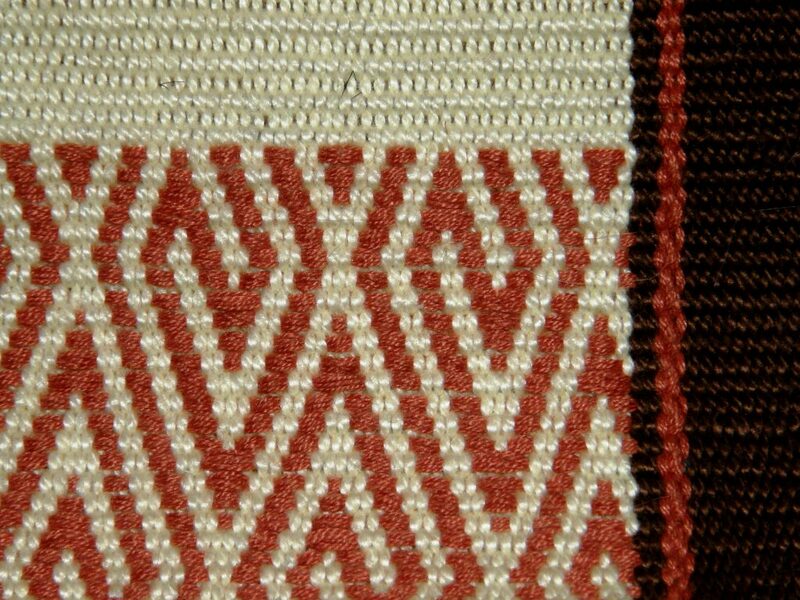 To weave bands decorated with patterns made with a supplementary weft, I start off with a warp prepared for plain warp-faced weave. 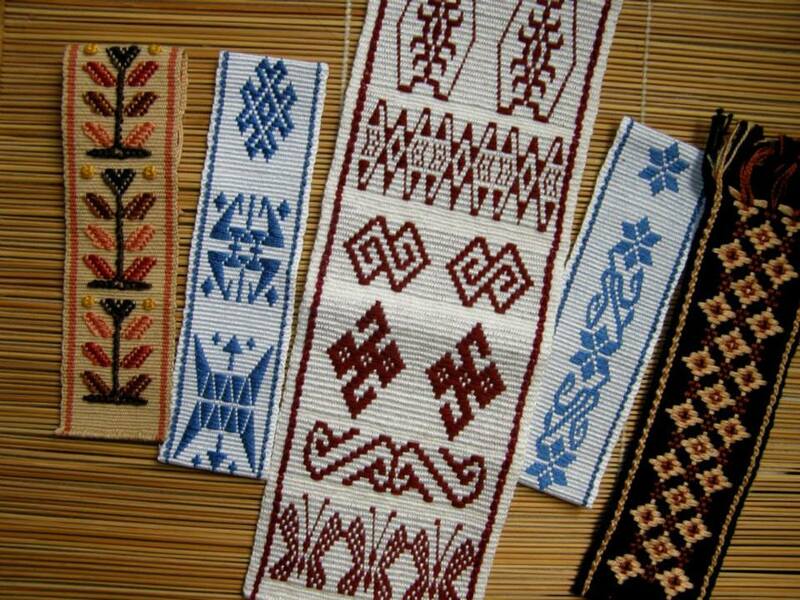 Here are some examples with cotton plain weave decorated wth silk, cotton and tencel suplementary weft. For this tutorial, I have used strong primary colors which show up well in photos. My yarn is 24 wpi mercerized crochet cotton (approx #3 crochet cotton). 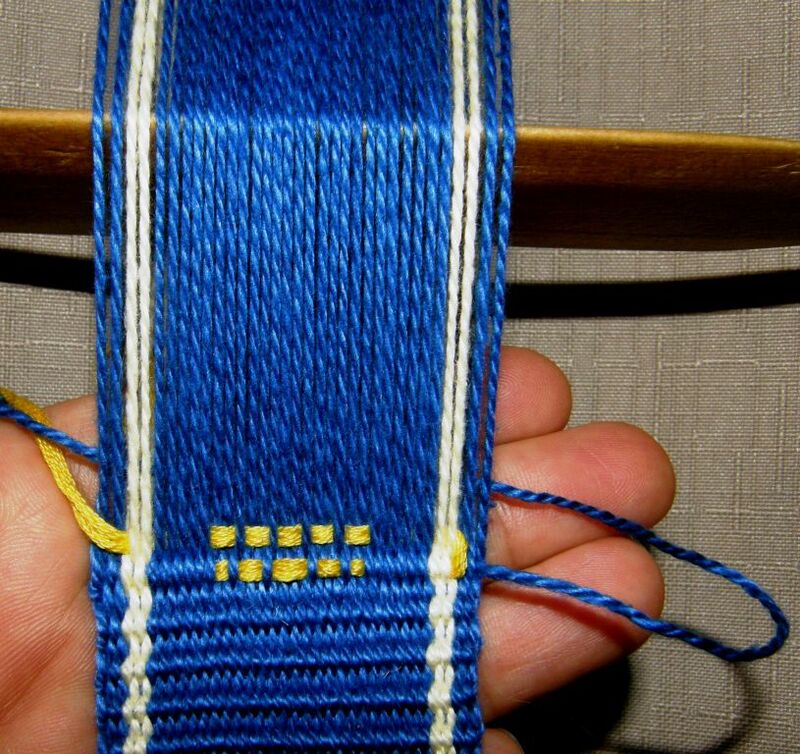 The blue base, seen below, has a pale yellow stripe next to each edge. 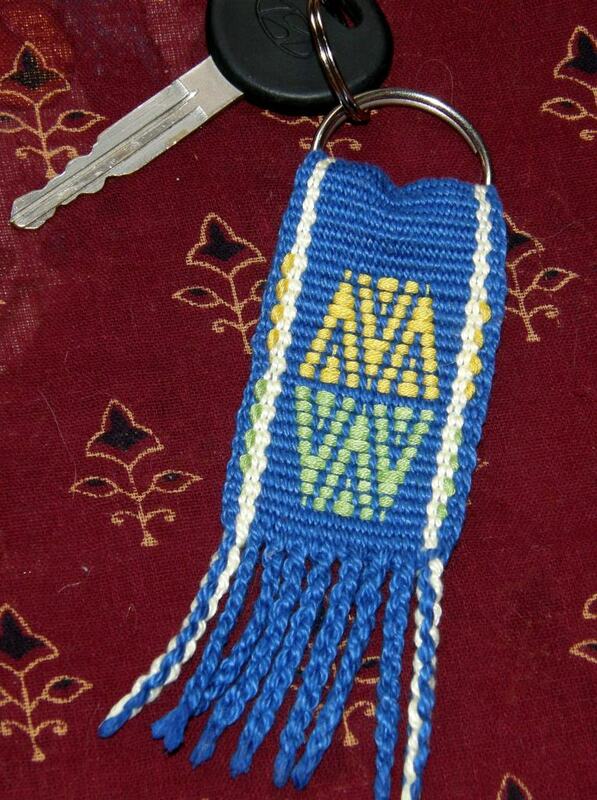 As I used my mini portable warping board, I have just enough warp to make two key fobs. Instead of a shed rod I am using a simple shed loop and I have put the end loops on a needle to have a smooth rather than fringed start. You can see more about the needle start in this previous post. 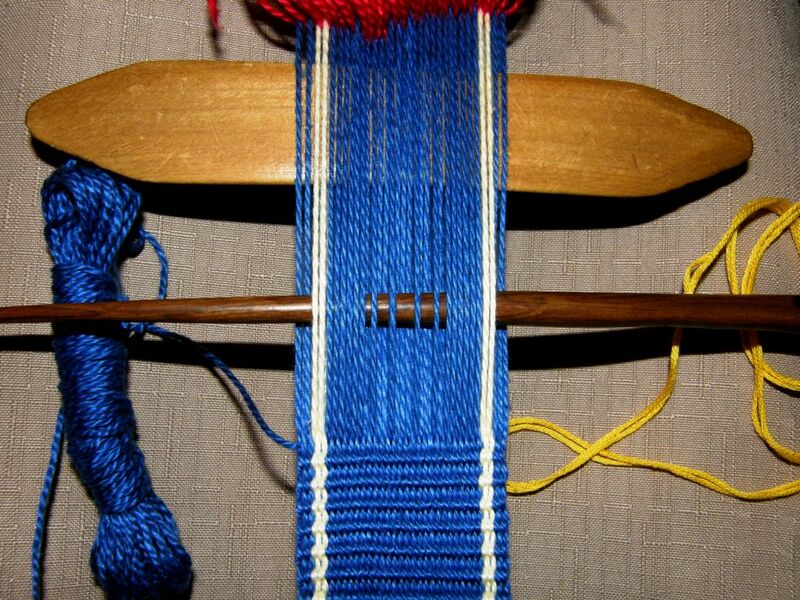 A warp prepared for plain weave. There are two sheds-the heddle shed and the shed loop shed. Enough plain weave has been woven to be passed through the key ring, folded and sewn. Now I can begin the pattern. We introduce the color of our choice as the supplementary weft with which to make our patterns. I am using doubled strands of embroidery floss which work really well with the 24wpi plain weave base. Although I use the strands doubled straight off the skein in this tutorial, you might find that you get better coverage in your pattern by pulling out all six threads in each embroidery floss strand and then laying them side by side. This will take out the slight twist that is in the embroidery floss strands and enable it to lie flatter. 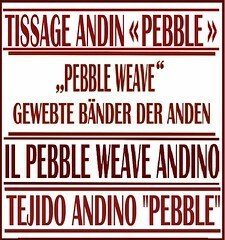 The supplementary weft always needs to be a lot thicker than the main weft. Several fine strands of thread work better than one thick one. 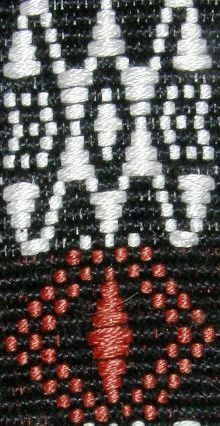 Embroidery floss has 6 fine threads per ”strand”, lies flat and gives good coverage. You want to use something that lies flat more like a ribbon than a round piece of yarn. 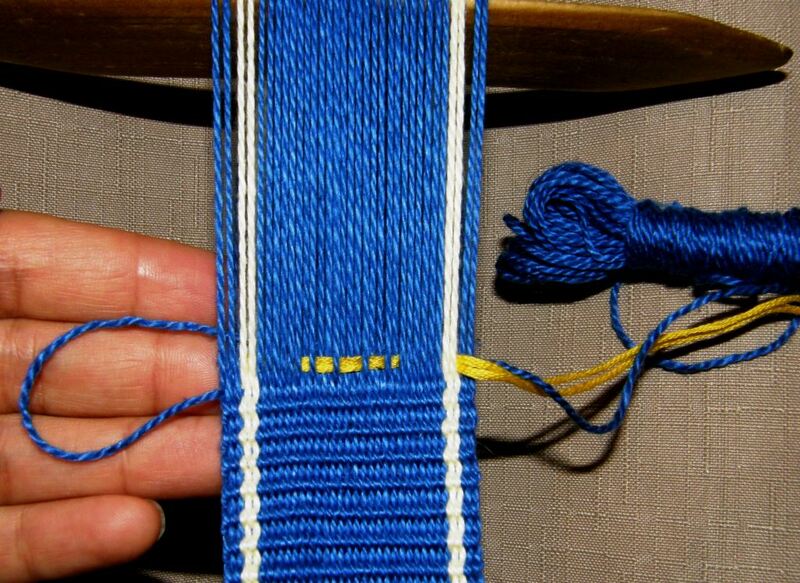 Looking at the photos below, you will see the difference in width between the blue warp and weft threads and the yellow supplementary weft. 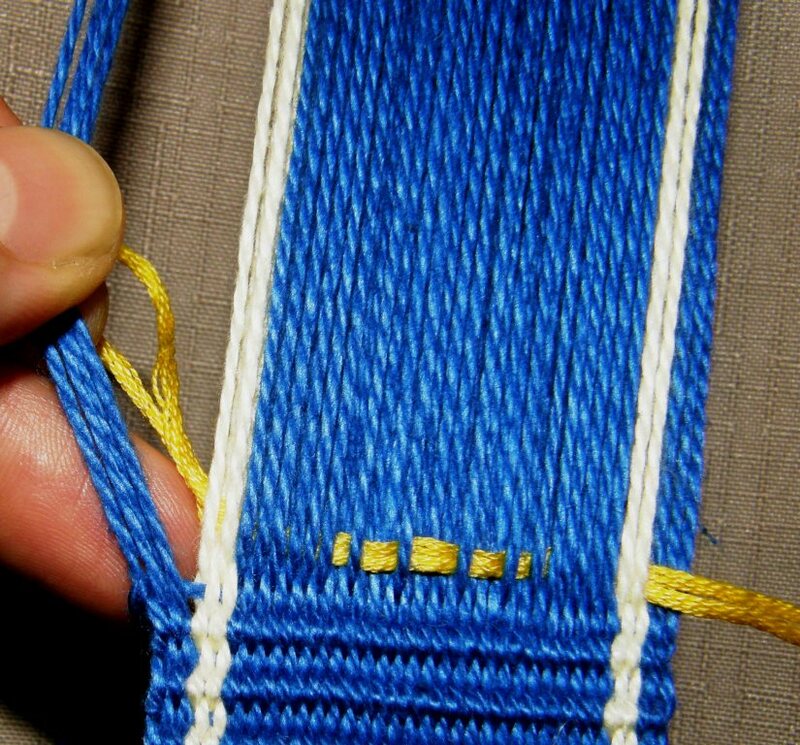 The blue weft will continue to form the structure of the plain weave while the yellow independently forms the motifs. You may recognize this diamond chart from my double weave projects. 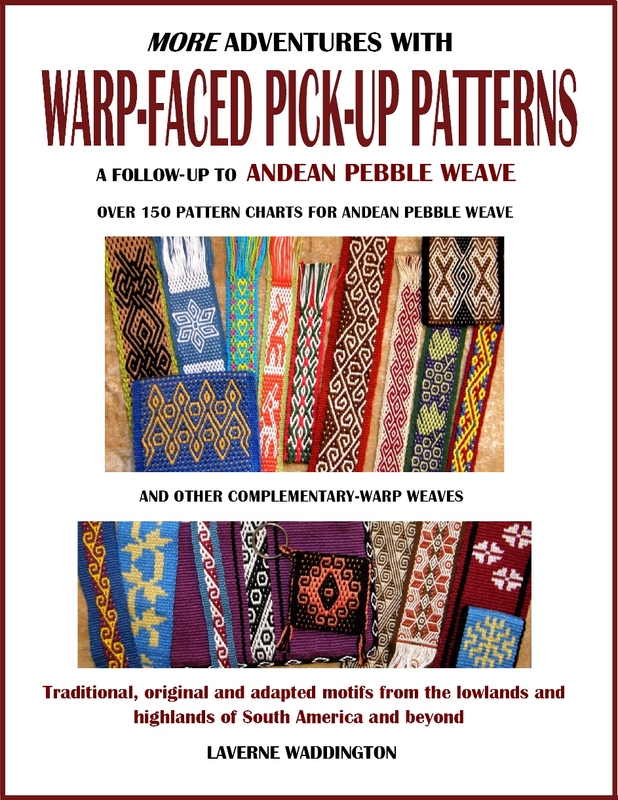 For supplementary weft patterning, we need to look at the chart in a slightly different way. In double weave the yellow spots would indicate the warps that need to be picked. 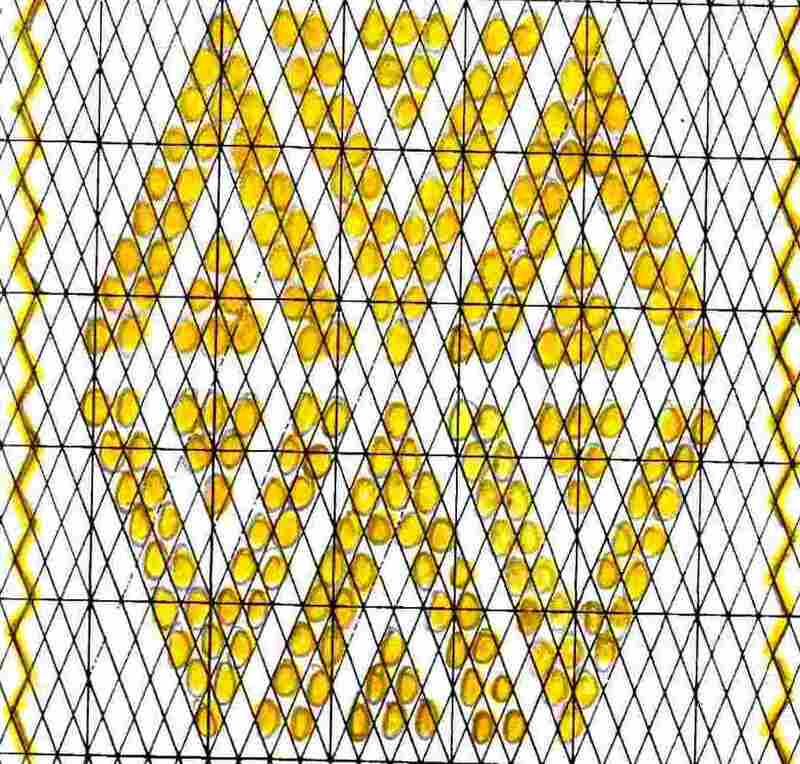 However, in this technique the yellow spots within the diamonds represent each warp that needs to be dropped in order to expose the supplementary weft. Now let’s see this in action…….. Dropping the warps in the first row of pattern. Passing the supplementary weft through the shed from left to right. 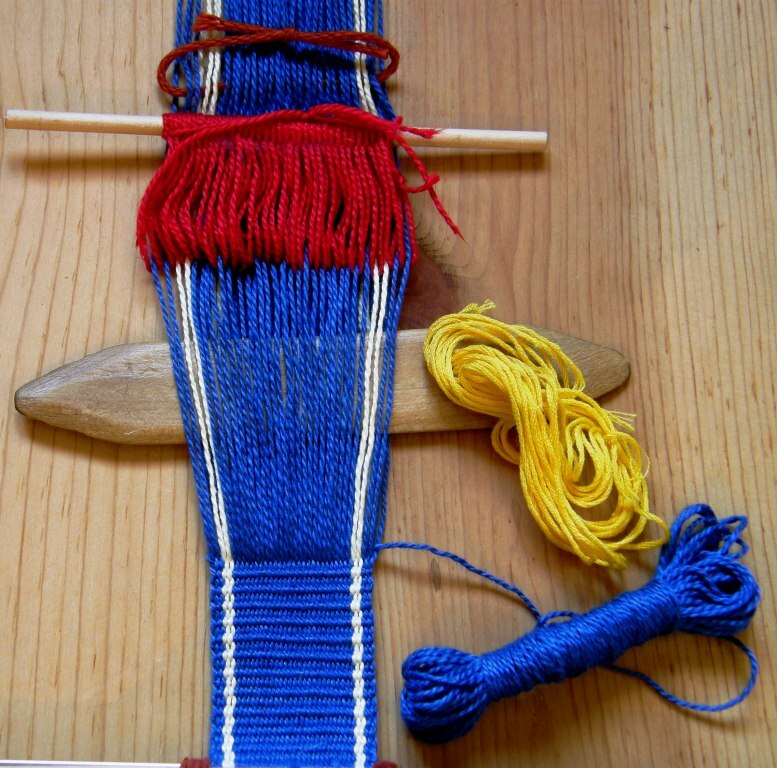 I am separating the warps to show the starting tail which is left hanging out under the weaving and which can be trimmed when the band is finished. You can see that I am laying in the supplementary weft only from one yellow edge stripe to the other rather than all the way across the band. Passing the main weft from left to right under all the warps in the open heddle shed. This completes the first row. You could also pass the main weft FIRST and then drop the warps and pass the supplementary weft. In fact, that is probably a more logical way to do it. It doesn’t matter which way you do it. Choose the way you prefer and then try to be consistent. I have opened the shed loop shed , placed my beater within and beaten. Now I am dropping the warps in the shed loop shed according to the second row of the pattern chart again counting the warps from right to left-keep six, drop two, keep one, drop two and so on. 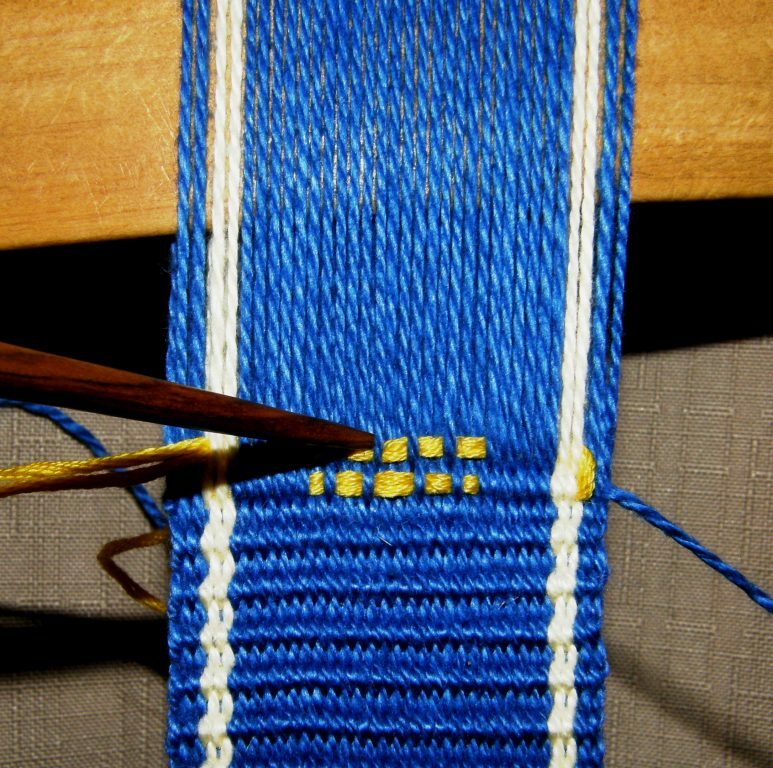 Again, the yellow supplementary weft is passing from the edge of one stripe to the other turning on the surface of the weave. I am laying in the weft loosely and pushing it into place with the pointed stick . After passing the main weft from right to left under all the warps in the open shed loop shed, I open the heddle shed, place the beater within and beat, ready to do row three. I am finishing the third row. 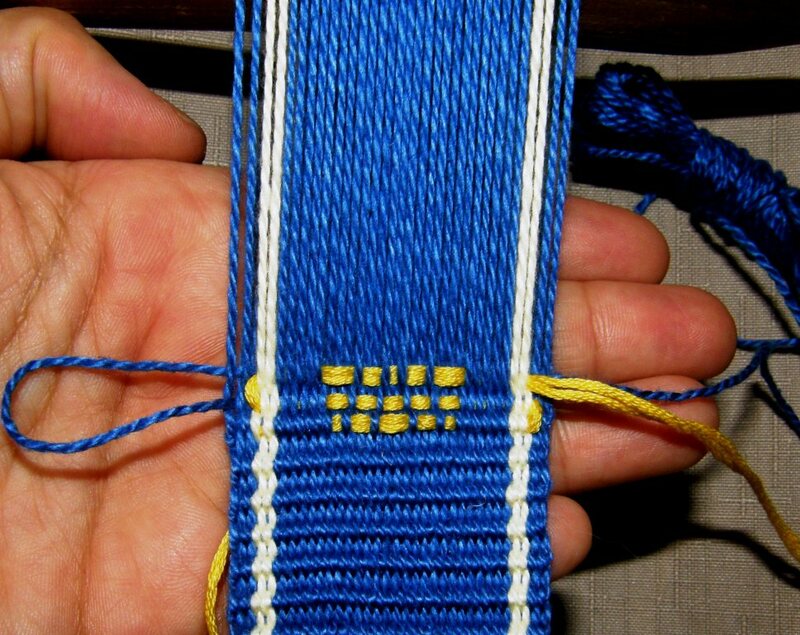 You can see that the yellow weft turns on the surface of the weaving at the stripes. 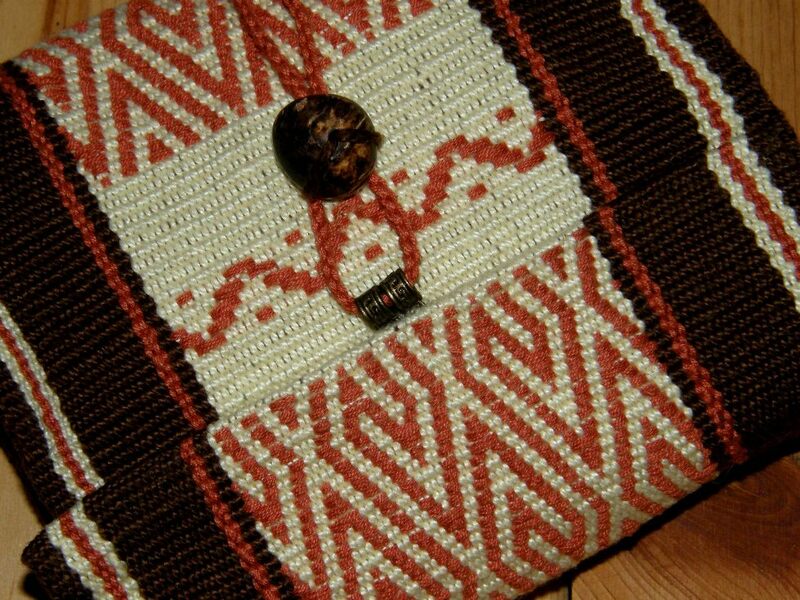 You could also carry the supplementary weft all the way to the edge and have the weft turns, or ”bumps”, along the edge of the band. If the bumps are of consistent size, they can look very nice along the edge…almost like beads. One half of the motif is finished. I can continue with the same color or introduce another. 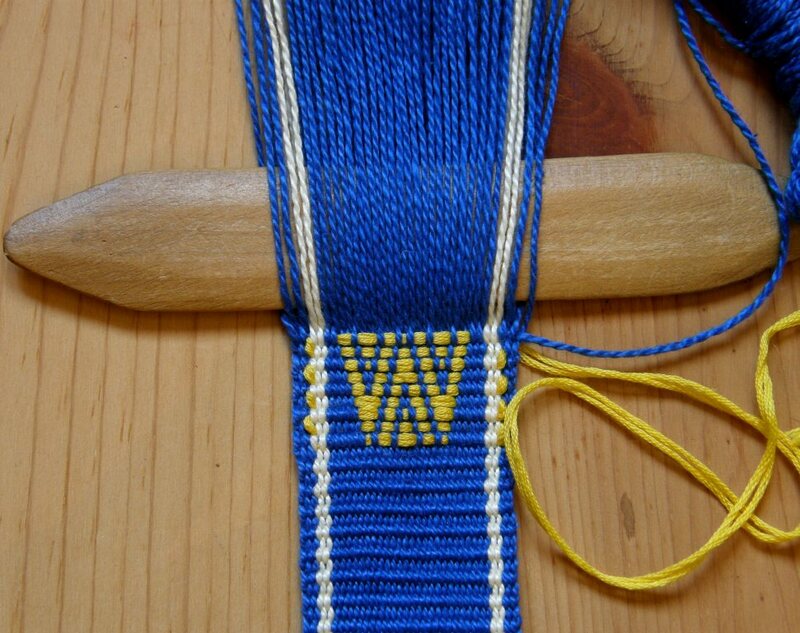 The finish tail of the yellow weft will be left hanging out the back of the weaving. If you have packed your wefts in firmly, you will be able to safely snip the tail off when you finish the band. 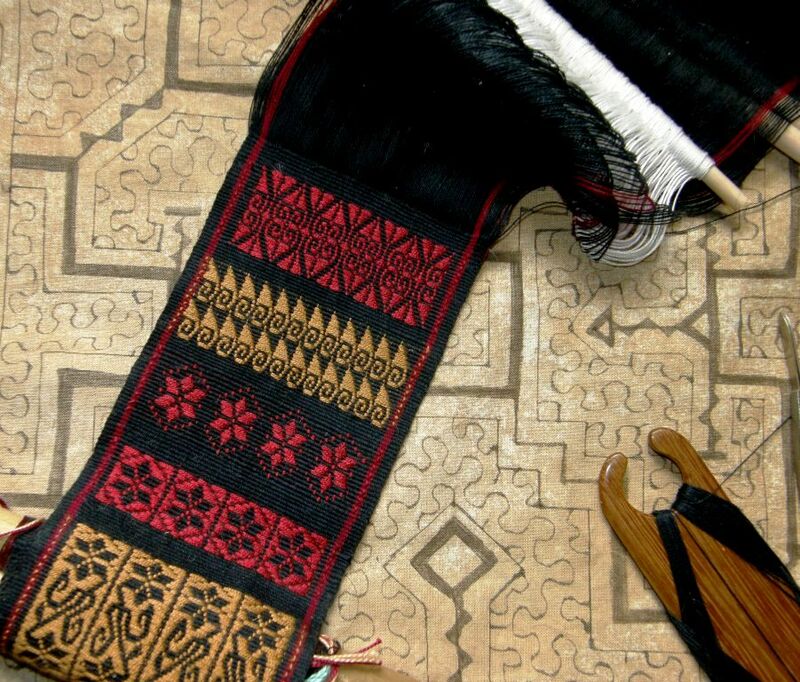 On this Central Asian design that I made you can see that the turning wefts on the left form their own decorative ”stripe’ on the plain weave. The turns of the pattern wefts in this piece virtually disappear against a stripe of the same color. 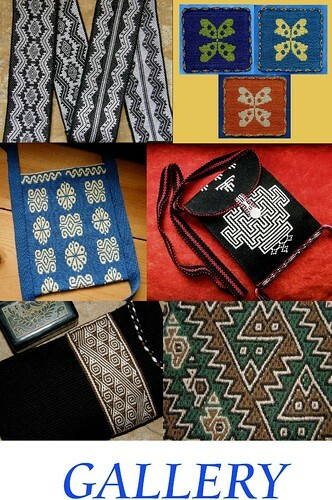 I have put the pattern charts for these motifs as well as the Central Asian and Huni Kuin inspired designs on a separate page. You can design and print out your own blank diamond charts here. I also have oval cell charts there which many people prefer using. If you are planning your own designs with this weight of warp thread, as a general rule, it is best not to have weft floats that span more than four to six warps. 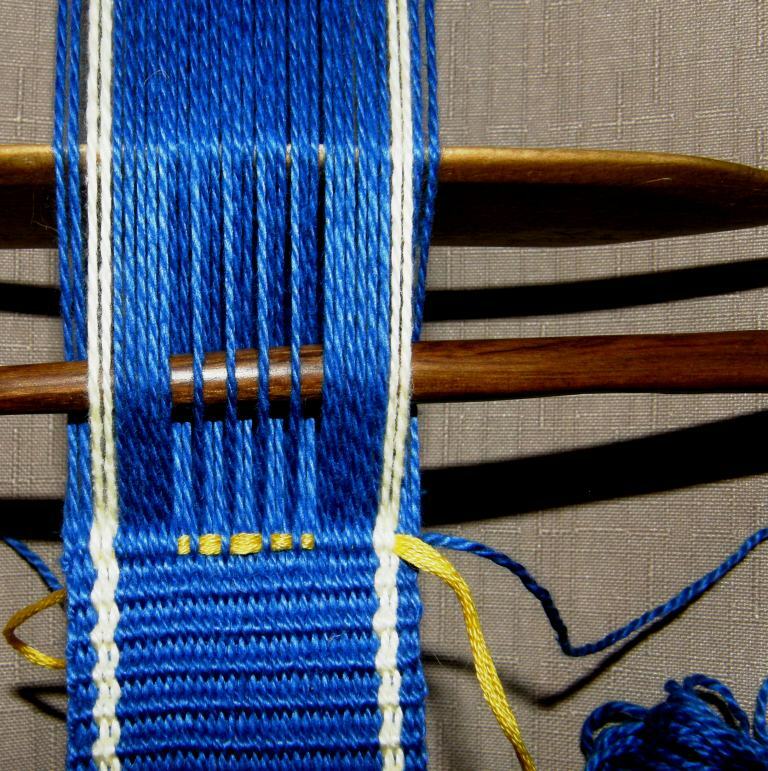 This will change if you use finer yarn for the warp, of course, and the purpose of the piece you are weaving will also play a role in determining how long the weft floats should be. You need to consider that long floats on a key fob or bag will easily catch on things whereas on a hatband, for example, they may not be a problem. You should also take in account the fact that floats over a single warp, for example the points of the triangles in my sample design here, can barely be seen. 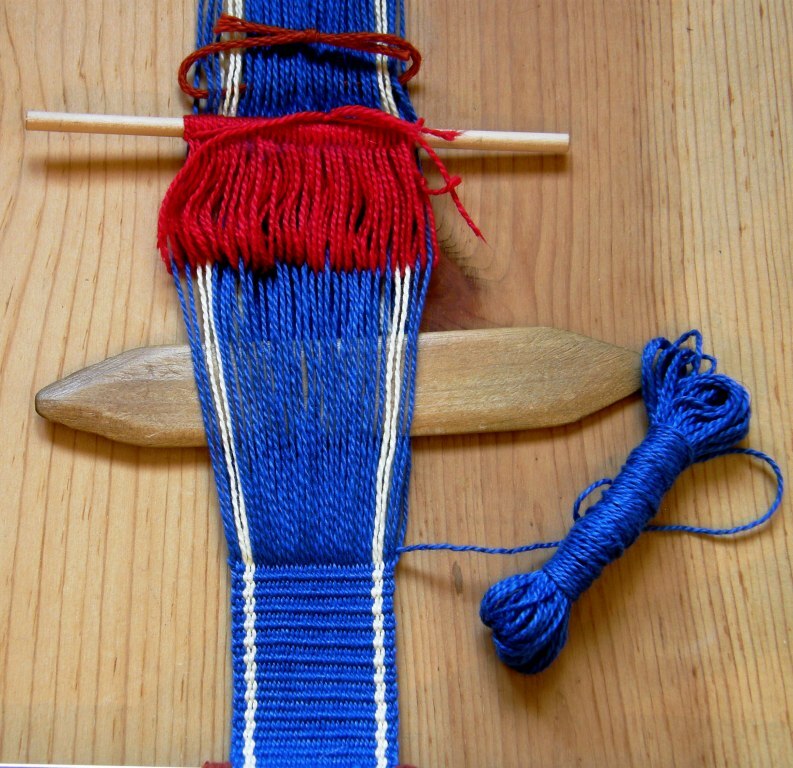 Try to have your weft floating over a minimum of two warps. I finished the motif in another bright photogenic color and have turned the loom around to weave another key fob on the other end. You can see that the design does not show on the back of the band. 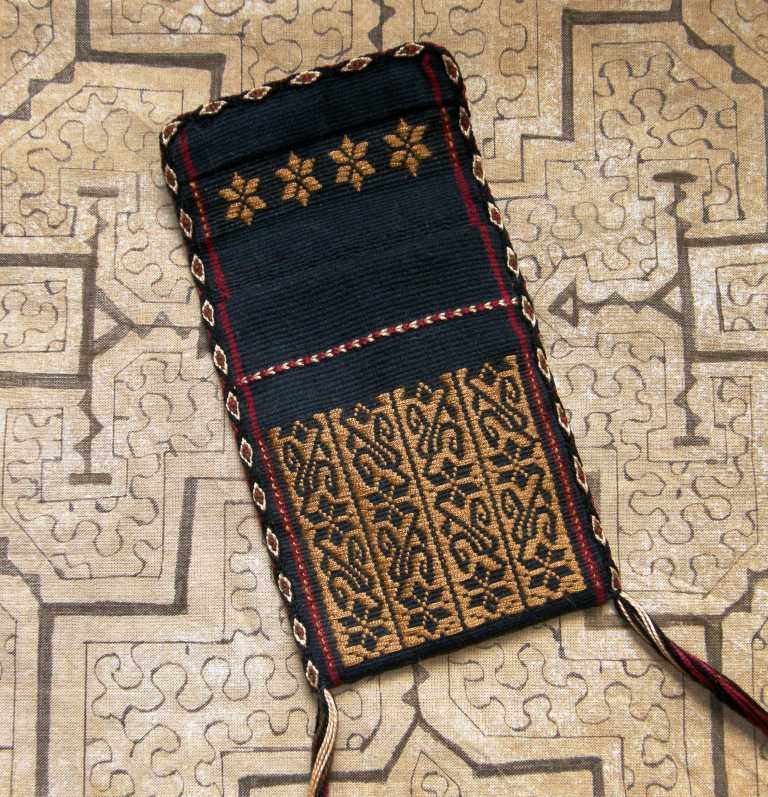 Two key fobs can be made on one warp. First I weave one and then I move the shed loop to the other side of the heddles, turn the loom around, pass a needle through the end loops and start weaving from the other end. 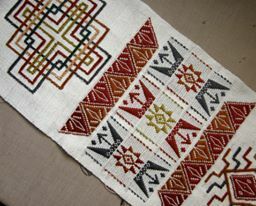 I cut between the two small weavings when I have finished and then braid the ends or leave them as fringe. If you choose to do this in finer thread, say a number 10 crochet cotton (35 wpi), one and a half strands of embroidery floss works well. The example at left was done this way. As you use finer an finer warp thread, the length of the weft floats can also increase.Here is a project I recently finished in 60/2 silk which allowed me to have floats covering up to 17 warp ends…. I’m going to try this today….it looks so interesting. Thanks for all your tutorials. I have a question….I don’t know how you finish the braids on the fobs…..tie a knot??? It doesn’t look like there’s a knot in the end of each braid. 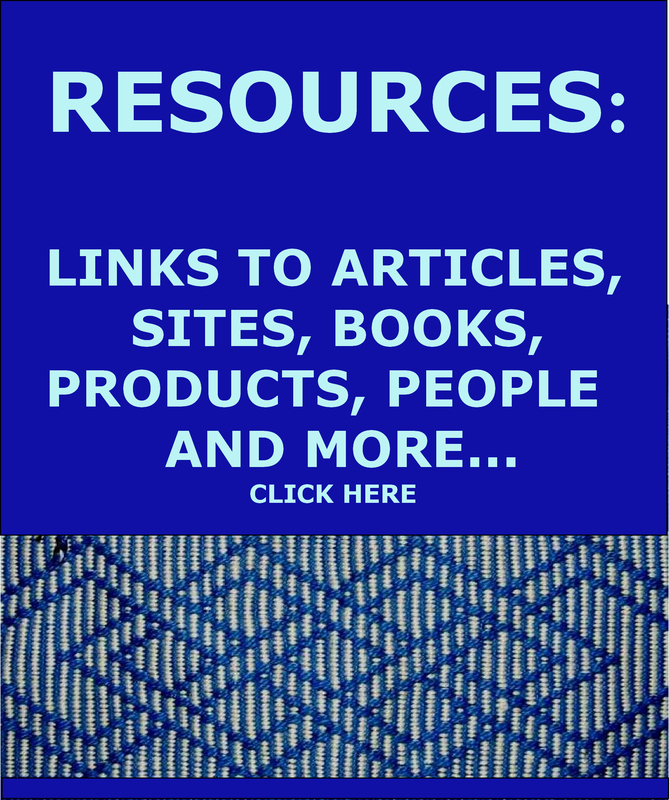 Thanks for your help and keep posting these wonderful articles. I think knots at the ends of braids on small items look cumbersome and so I paint the ends with diluted white glue and when the glue is drying I pinch the ends into points so they are not so blunt looking. 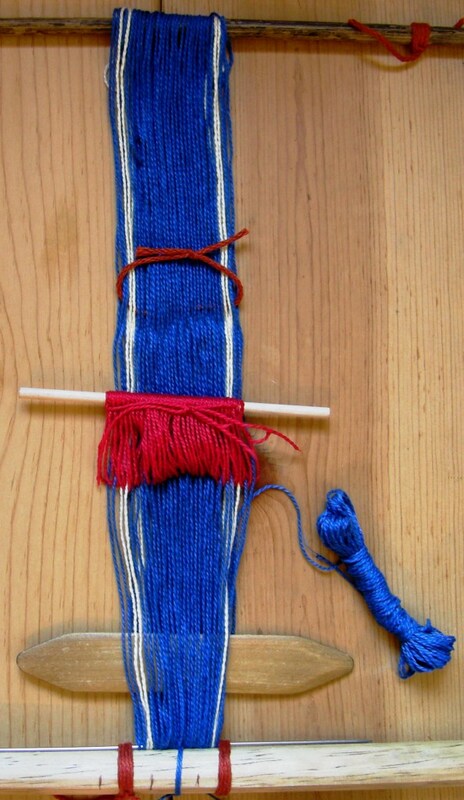 The glue then prevents the braid from unravelling. You’re welcome. Martha. Good luck with your weaving. I have been watching Andrea N. With her diamond inkle pattern. I love it and then found her blog. She mentioned you and now I see why she did. Thank you. I will be using the blog to learn this method. I didn’t want to use my good cotton threads for my first trial run and I am using polyester (I can hear the moans!). Probably sorry to use it, but I am trying it to see if I can even do it b4 using the good stuff!